More than 200 guests including Holocaust survivors, representatives of parliament, diplomats, scientists, and clergy joined together on 28 January in Bern, Switzerland to commemorate International Holocaust Remembrance Day. The event was a joint project of the various member countries of the International Holocaust Remembrance Alliance, with cooperation by the Historical Service of the Swiss Federal Department of Foreign Affairs and the Gamaraal Foundation, which supports Holocaust survivors and is engaged in the field of Holocaust education. The event was organized by the embassies of Israel and Italy, the current chair of IHRA. One of the quintessential pieces displayed in exhibition shows a frame with falling Hebrew letters represents the chaos of the Holocaust. 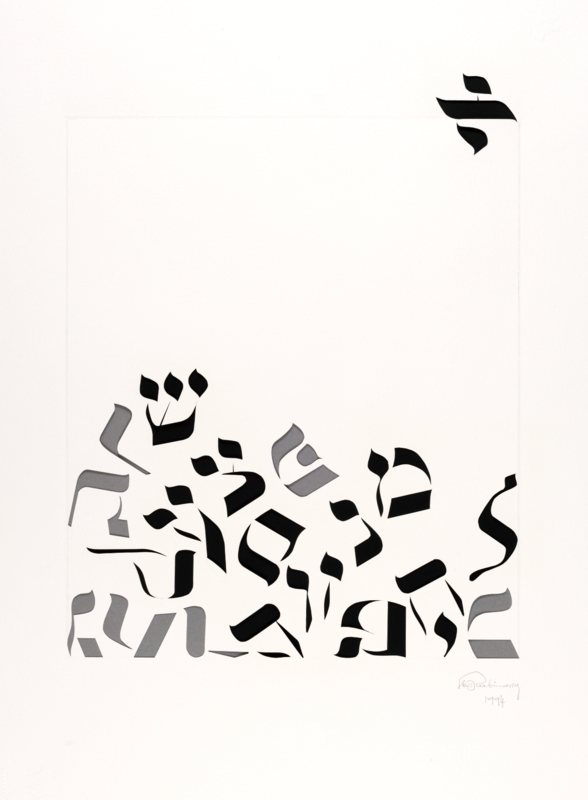 The letter Aleph in the upper right corner symbolizes Rabinowicz, who separated himself temporally and physically from the horrors. In the piece, a part of the letter remains within the frame, symbolizing that the survivor is forever marked by what he has experienced. Rabinowicz said of his artwork, “I am a survivor of the monstrosity and tyranny of the German Nazi regime. A regime that had set itself the goal, and almost achieved it, of annihilating European Jewry and eradicating its culture. I was rescued from the barbed wire of the concentration camps, physically and mentally deeply wounded and marked for the rest of my life; uprooted from my own culture and security." The ambassadors of Italy, the United States, Germany, and Israel, as well as the President of the Swiss National Council Marina Carobbio Guscetti and the President of the Swiss Federation of Jewish communities Herbert Winter delivered messages of remembrance. The program was concluded with a reading of a poem by Primo Levi and a mourner’s prayer.